Who Wants To Trade For These Items Below? 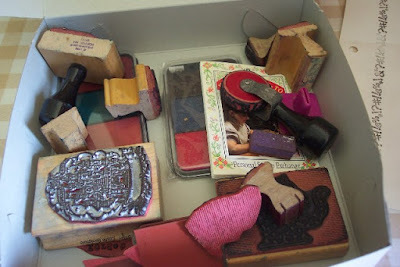 I have this pile of used rubber stamps and a couple of ink pads. I will add a whole pile of ephemera stuff to fill the box to the maximum. Papers, images, doo dads and other stuff, trust me, it will be packed to the fullest!!! Just an ephemera packet to offset my shipping costs for this box. If you are interested to put dibbs on this deal, leave a note in the comments and send me your address to my email address: (artist@mts.net) minus the brackets. If you feel like it please come to see me and play! Oh, I am glad your back, and that you had a nice web-free vacation...I love my goodies from you!